WHAT IS WRONG WITH THE ABOVE PHOTO??? The JCB body was raised from the ground using two (2) jack supports and its loader buket while two mechanics was working under it. One mechanic is greasing the under chassis parts and other is giving assistance. THIS IS UNSAFE PRACTICE PLEASE DON'T DO IT. Field maintenance procedure to be developed. 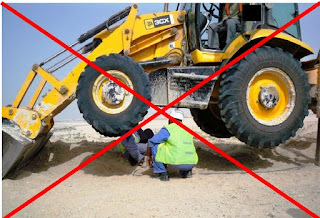 Tool Box Talks (TBT) should be done prior to commence any critical maintenance works, whether it will be on workshops, construction sites, etc if required. Greasing activities under chassis parts should be included during the maintenance of the equipment as scheduled accordingly and to be conducted at workshop where under chassis pits are available. Provide or Fabricate vehicle ramps at site if under chassis works could not be avoided. In case you will see similar activities to your project site or working areas, STOPPED the activities immediately and give Tool Box Talks to the concern mechanics.